The Winnipeg Convention Centre plays host again this year to the 35th annual Piston Ring World of Wheels. The show runs from March 27 to March 29 and features Extreme Motorcycle 2009 presented by Rolling Thunder, Club Challenge presented by Auto Trader Publications, and The wild Atomic Punk bubbletop car! Plus appearances by George Barris “King of the Kustomizers” and Chip Foose – America’s Favorite Custom Car Builder from Overhaulin. Tickets are available at the gate or at any Winnipeg Piston Ring location. Among the many vehicles on display is a brand new chopper decked out in some of the best airbrushing I’ve ever seen. The Revelations Chopper is now complete and will be unveiled at the World of Wheels this weekend. It is completely covered in artwork from the Book of Revelation. 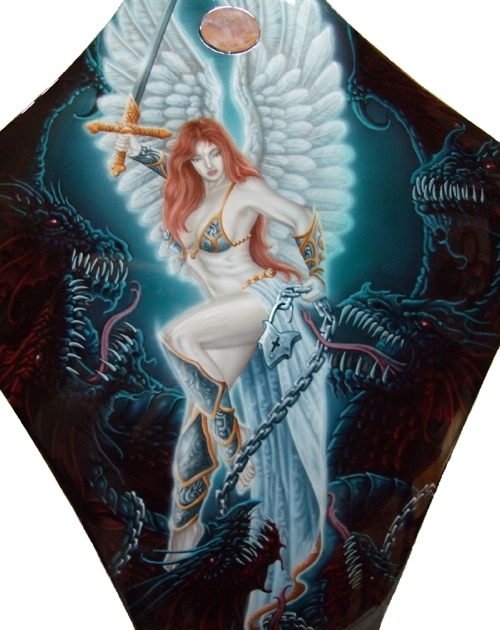 The artist is Dale Lawrence, noted as one of the top 50 airbrush artists in the world. Have a sneak peek at the fuel tank (left).